Corporations are suddenly getting cold feet about the way they make their money. At least that's what they say. I mentioned this some months ago after I met Jeffrey Immelt, the chairman of the biggest US industrial company, General Electric. He didn't put it like that, of course; he was full of enthusiasm for the programme the company had just launched called Ecomagination: a strategy to concentrate attention on the environment and profit from it. I mentioned then what a powerful agent of change business can be when it puts its mind to it - for better or for worse. Well, the movement appears to be gaining momentum. Last week I flew to Amsterdam (I will plant a tree to minimise the carbon effect later) to see a man called Herman Mulder. He is one of the prime movers of an agreement which is signing up some of the world's biggest banks, called the Equator Principles. These are a set of broad headings with (as the name suggests) global pretensions. After decades of questionable bank lending which produced dubious results in the developing countries, the 30 banks who have now signed up to the Equator Principles are agreeing to limit their lending to seemingly decent big projects. They promise to consider all the impacts of their lending: environmental, social, political, reputation. They want to create a level playing field where no bank can undermine the others with a lowball bid on a questionable project. The importance of this is explained by Herman Mulder's job. He is vice-president in charge of risk management for the whole of ABN Amro, the international Dutch group which is the 30th largest bank in the world. ABN Amro has decided to embrace the idea of sustainability in its business. 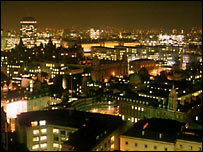 That means more than just switching the lights out in its offices and recycling the printer cartridges. It means trying to apply sustainability principles to the money it lends and the companies it invests in. How did this happen? Eight years ago, a Dutch NGO approached ABN Amro saying that it was involved in financing a project in Indonesia which the bank should be ashamed of. The Bank investigated, and found the NGO was right. It got its borrower to clean up the project. And this led the bank to decide to take sustainability and other concepts into its risk management of its business for the first time. 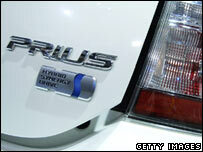 Why did US carmakers miss the hybrid boom? This is how Herman Mulder puts it: unsustainability is a big risk for the Bank, and risk management is at the core of everything the bank does. "We and our clients are learning how to deal with a much more open world: much faster, much more pressure from NGOs, from governments, from consumers, from employees," he says. "From a major corporation society now expects that we care about tomorrow. "Globalisation is a reality. There is nowhere to hide in a knowledge society from our stakeholders." In other words: lending to dodgy companies is a risky business, and at some stage the shareholders and the stock market are going to appreciate and applaud that change of heart. Another man who's experienced the capitalist wake-up call is former US vice president Al Gore, the candidate defeated for the presidency in 2000 by George Bush. Together with a canny ex-Goldman Sachs banker David Blood, he has set up a firm called Generation Investment Management (not Blood and Gore as so many people expected) to seek out sustainable investments. 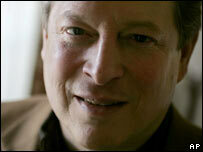 Al Gore told me he was amazed at the short-term horizons upon which most investment decisions were made. His example was the big car companies GM and Ford, businesses hypnotised by quarterly earnings and the temporary success of SUVs which blocked them from producing a hybrid vehicle such as the Toyota Prius. Now it's all very well for Al Gore to have his epiphany. But he is an American, and lots of Europeans are very worried about the way the world's most profligate country refuses to sign up to any diplomatic attempt to restrict carbon emissions of global warming. In response, concerned Americans now say: look at what is happening outside the confines of the White House. Al Gore says that the CEO of one of America's biggest companies told him the other day that within 15 minutes of Bush leaving office, America's attitude to the Kyoto Agreement will have changed - and it may even happen before he leaves office. Gore says it is important for business to get in with voluntary measures before the regulators arrive. He is using the huge leverage of the capital markets to tilt business in the direction of sustainability. Now of course there is a strong element of self-interest in this, but as the British campaigner Sir Jonathon Porritt says: don't expect business to act philanthropically. Something is up in the world, when bankers start getting sustainable. Maybe it's that fashionable thing - a tipping point. This week's In Business on Radio 4 will be broadcast at 2030 GMT on Thursday 26 January and at 2130 GMT on Sunday 29 January.